After Dustin Byfuglien carried the puck to the bottom of the left circle, Bryan Little gathered the loose puck. He fed a streaking Patrik Laine, whot fired a wrist shot over the glove of Jordan Binnington and in. Oskar Sundqvist won the draw back to Colton Parayko, who moved down the right wall. He dropped a pass back to David Perron, who snapped a shot from the right point that beat Connor Hellebuyck blocker side. Patrick Maroon sent a backhand pass from behind the Jets net to Tyler Bozak in the slot and he lifted a shot over the blocker of Connor Hellebuyck and in. Jets trail in the series 1-0 after losing Game 1. Winnipeg was 3-0 in Game 1’s in the 2018 playoffs and are now 3-3 in Game 1’s in franchise history. Winnipeg was 26-5-4 when leading after two periods in the regular season and 19-7-5 in one-goal games. Jets were 9-0 when leading after the 2nd period in the 2018 playoffs. Jets penalty kill went a perfect 3-for-3 tonight. Power play finished 0-for-1 tonight. Scored the first goal for the Winnipeg Jets in the 2019 playoffs. Laine had five goals in 17 games in the 2018 playoffs. Registered the primary assist on Laine’s goal. Little had five assists in 17 games in the 2018 playoffs. Registered the secondary assist on Laine’s goal. It’s the 24th career playoff assist for Byfuglien, and 13th as a Winnipeg Jet. 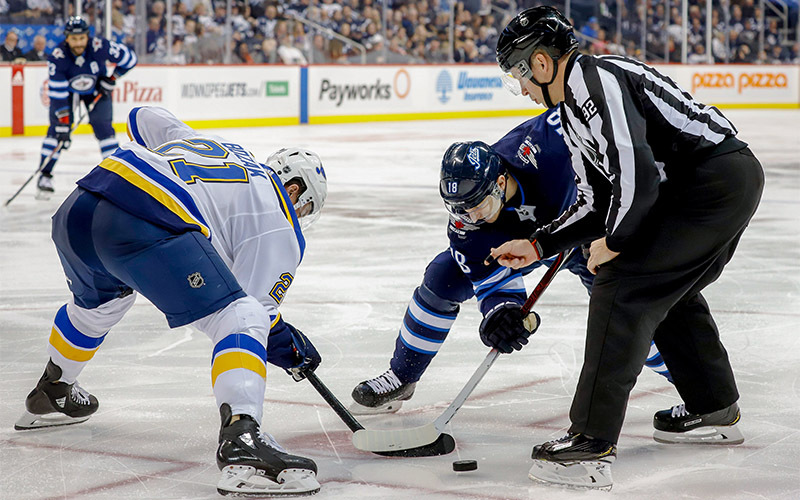 Byfuglien had 11 assists during the 2018 playoffs. Led the Jets in TOI with 25:30. Led the Jets in blocked shots with three and hits with six. Led the Jets in shots with 4.